Serves 4-6. Preparation time 5 minutes. Cooking time 15 minutes. • Blanch the leeks in boiling water for 2 minutes, remove and set aside. 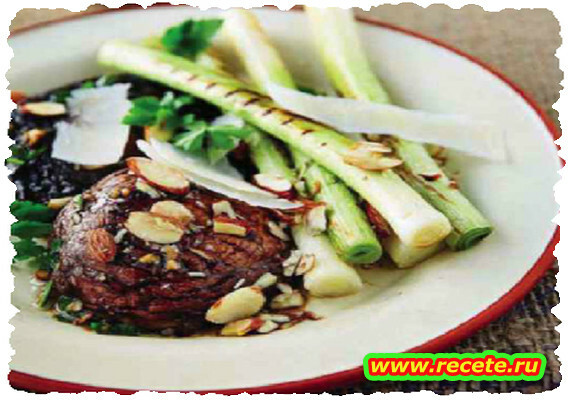 • Score the tops of the mushrooms and put them in a shallow dish with the leeks. • Mix the rest of the ingredients, except the cheese and nuts, and pour over the vegetables. Braai on a hot grid brushed with oil, turning frequently until the leeks are tender and the mushrooms are cooked through. • Return the veggies to the dish with the marinade. Scatter some parmesan shavings and nuts.